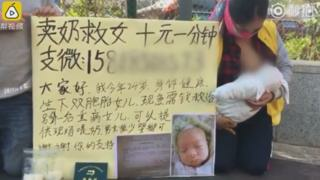 A young mother in China is selling her breast milk on the street to raise money for her sick daughter's medical bills. In a video posted by Pear Video on the Miaopai video website, the mother and her husband explain they need to raise at least 100,000 yuan (roughly £11,250) for one of their children, who is in an intensive care unit. It's been viewed more than 2.4 million times and has had more than 5,000 comments since it was shared on China's social media platform Sina Weibo. The video was filmed in Shenzhen's Children's Park - situated centrally in Shenzhen, a major city in the Guangdong province of China. The mother says she is selling her breast milk to raise money quickly, because one of her twin daughters is in the intensive care unit at the Bao'an District People's Hospital in Shenzhen. Her husband explains that the couple owe the hospital "hundreds of thousands of yuan" and "the doctor said that once she's cured, we should prepare to pay at least 100,000 yuan (roughly £11,250)". There have been criticisms of Chinese healthcare in recent years as medical centres have been labelled overstretched, and amid claims that people pay extra to jump queues. The reaction online has been mostly sympathetic, with people sharing the phrase "sell milk, save girl". Users urged passers-by to "give money to them", with some saying they would donate if they saw the parents on the street. And one comment with more than 3,000 likes reads: "Once people in the lowest level of society become critically ill, they don't even have basic rights." But some users were less sympathetic, with one person lambasting the decision to sell breast milk as "a vulgar way of asking for help". Another added: "Everybody can understand that you are helpless and hoping to receive aid, but how can you retain your dignity if you have to sell milk?" But one person criticised the negative comments, saying: "This is the love of the most helpless parents… those who are saying nasty things online should think that if this was your child, would you care about maintaining face, or your child's life?"